Youth organisations play a crucial role in the achievement of the United Nations 2030 Agenda for Sustainable Development and young people are recognised in it as “critical agents for change”. Three years into the implementation of the 2030 Agenda, what role do youth organisations in Europe play? 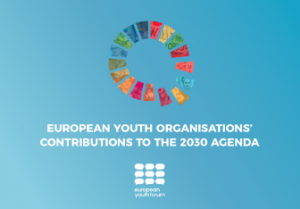 The European Youth Forum’s new study “European youth organisations’ contributions to the 2030 Agenda” presents key data and case studies documenting these contributions. Presenting qualitative and quantitative data collected from 89 youth organisations across 37 countries and with concrete recommendations for governments and public institutions, this study can serve as a toolkit to work more effectively with and for young people towards a more sustainable world. A case study about the National Union of Students in Denmark (DSF). The study case covered the Sustainable Development Goal 4 (SDG4) and the impact of the different campaigns carried out by DSF, a national students’ organisation. A case study about the European Students’ Union (ESU), where all Sustainable Development Goals (SDGs) have been covered, mainly SDG4. ESU sees the SDGs as having a major role to play, not only in framing the work of the advisory group but in informing the strategic decisions of ESU itself.